Source: Genesis Water Technologies, Inc. 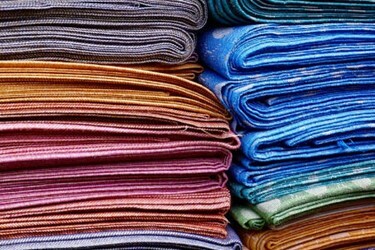 The textile industry is a water consumption intensive industry. Water is utilized for cleaning the raw material, and for the different steps in the textile dyeing process. Due to the effects of water scarcity and stricter environmental regulations, the cost of fresh water utilization has increased worldwide. In addition, the textile industry is faced with pressure by government regulators to move toward sustainability, by reducing the consumption of water, while internal pressures to maintain or increase profit margins for their stakeholders exist as well. Companies within this industry, utilize varying amounts of water, depending on specific processes operating at the mills such as the fabric used, equipment used, and the prevailing management philosophy concerning the usage of water. Wool and cotton fabric materials processing requires a higher consumption of water than other subcategories such as polyester or nylon for instance. The vast amounts of wastewater generated by textile processing facilities creates several challenges. These issues include, treatment chemicals, wastewater treatment operating costs or surcharges, sludge disposal costs, and power consumption. These keys issues, make the challenge of allocating and effectively managing water, with a focus on sustainability and energy efficiency a critical component to textile processing operations. Meeting these challenges with sustainable treatment solutions, prevents water pollution from entering into our local watersheds protecting the public health and surrounding ecosystems. Non biodegradable organics/inorganics such as metals, phenols, color, pesticides and phosphates and certain surfactants. The characteristics listed above and other potential contaminants can present problems for facilities that use conventional primary treatment methods including biological reactors for wastewater treatment. These contaminants also present challenges to municipal wastewater treatment facilities, as these facilities are typically not equipped to treat these contaminants in an efficient way. Utilizing a new approach through the use of advanced primary and secondary water treatment solutions is necessary to meet the challenges faced by the textile industry now and into the future. Electrocoagulation is one of the emerging water treatment solutions capable of handling the varying wastewater characteristics of textile industry effluent. This advanced technology utilizes the advantages and functions of conventional flotation, coagulation, and electrochemistry in water and wastewater treatment to optimize contaminant removal in an environmentally sustainable and cost efficient way. This specialized solution provides companies with new and existing wastewater treatment systems the opportunity to optimize their current treatment process, adding dependability, reducing operating & maintenance cost, sludge disposal costs, and the mitigation of environmental concerns relating to toxic non biodegradable solids sludge disposal. Advanced electrocoagulation water treatment solutions can provide value in several aspects of the textile wastewater treatment process. These aspects include primary pretreatment to remove/reduce non biodegradable, toxic compounds and color prior to a biological process or as a polishing pretreatment for specific contaminants such as colloidal organics, minerals, or microbiological contaminants prior to ultrafiltration (UF) or reverse osmosis desalination (RO) systems. Textile wastewater treatment and reuse is a promising answer to conserve and augment available water resources and reduce harmful pollution discharge into the environment. This is especially felt in water stressed countries across Africa, Asia and Latin America were the textile industry is of vital importance to local economies. As companies in this industry move toward pursuing sustainability goals to reduce operational costs and comply with increasingly stricter regulations, it is becoming apparent that water reuse is one of the key component of these initiatives. Textile companies often produce wastewater containing elevated levels of dissolved and suspended solids, and color from their operations, in addition to potential non biodegradable contaminants. Based on the levels of constituent contaminants discharged, the higher the municipal wastewater disposal surcharge costs for the textile company. Reusing this water can provide a significant return on investment for textile producers not only through the removal of these wastewater surcharges but through the reduction of the cost to purchase fresh water as well. GWT specialized electrocoagulation wastewater treatment solutions are demonstrating their value in installations in textile water reuse applications from eliminating or drastically reducing chemical costs to significantly reducing sludge disposal costs and consumables expenses for secondary/tertiary treatment equipment. Water reuse and sustainability will continue to be important goals for environmental pollution prevention reduction practices in the textile industry. The textile industry will continue to choose and utilize advanced innovative water treatment solutions not only to reduce their operating costs, but to reduce their water footprint and decrease the ecological impact from their wastewater discharge and solids sludge generation on the surrounding ecosystem. Wastewater treatment process optimization will continue to be a key focal point for textile industry companies as the costs of wastewater disposal and fresh water consumption continues to escalate due to issues involving water scarcity. With an increasingly growing and progressively affluent global population, demands on our global water resources will necessitate higher water costs and stricter regulations. This is propelling textile companies and municipalities alike to re-evaluate their practices and push toward a more sustainable future. We anticipate that optimizing more efficient methods coupled with advanced treatment solutions to treat and reuse wastewater and process water will remain one of the most important points of textile manufacturing companies across the world into the future. A textile company wanted to reuse the wastewater coming from their process and textile dyeing operations to reduce their fresh water consumption costs and maintain compliance with increasingly stricter discharge regulations. Genesis Water Technologies with its local partner designed and provided a solution to effectively handle their water streams. The raw effluent was pumped from the primary holding tank through a self cleaning filter to extract the suspended solids. The pre-screened wastewater stream exited the self cleaning filter and was collected in a tank to be delivered via a submersible pump to a GWT specialized electrocoagulation (ECG) system followed by an advanced dissolved air flotation system to remove the coagulated solids. Tertiary treatment included advanced GWT sediment filtration systems followed by reverse osmosis desalination systems to provide clean water to be reused for textile production operations. 75% reduction in discharge charges. Additional operating cost reductions were witnessed from the reduction of fresh water consumption used in the textile washing and dyeing processes. Discharge compliance was maintained with lower sludge disposal costs which enhanced the clients return on investment.